Thank you for your interest in The Salisbury School. As a community, The Salisbury School is committed to instilling the skills and habits necessary for intellectual and social growth at an early age. 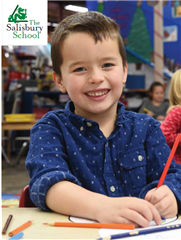 To that end, a caring, talented and responsive faculty strives to foster a lifelong love of learning in each child from pre-Kindergarten through grade 12. The Salisbury School’s students engage in a carefully structured curriculum that stresses academic excellence and college preparation while nurturing curiosity and individual learning styles. Additionally, The Salisbury School’s commitment to the arts, athletics, and community service allows students to express their ideas and talents in a variety of venues as they prepare for college and for life. We hope that the information provided here and in our admission packet inspires you to visit our innovative, award-winning campus on Hobbs Road. Ultimately, there is no better way to measure the essence of a school than to observe the faces of the children, watch student-teacher interactions, and hear the depth of questioning and inquiry in every corner of the building. Admission to The Salisbury School is competitive. An Admission Committee reviews all applications for grades K-12. We are seeking children of ability and character. Admission decisions are made in the best interest of the child by the school’s admission committee. The Salisbury School admits students of any race, color, religion, national and ethnic origin to all rights, privileges, programs, and activities made available to students at the school. It does not discriminate on the basis of race, color, religion, or national and ethnic origin in administration of its educational policies, admission policies, scholarship programs, or athletic and other school-administered programs.